1. Chanel Nail Polish in Azure - I think by now most of you know that I am often not the first to run out and buy a new color collection as soon as it hits stores. I usually let it sit for a bit and if I am still intrigued (and the products are still there), I make my move. But with this summer 2013 Chanel polish - things were different. I saw it on many different bloggers' Instagrams and knew I had to have. And it was love at first swipe. This is my third Chanel polish and not a miss yet - all have been splurge worthy. 2. Inglot AMC Face Blush in #59 - As a former makeup artist, I am ashamed to admit that I had never tried anything from Inglot. But after recently attending The Makeup Show, I was blown away by their products - this blush being my introduction. Not normally one for shimmer (let alone glitter), this blush imparts the most beautiful and healthy glow without any resemblance to a 13 year old glitter addict. Perfect for the summer when paired with a bronzy look, this will also transition well into fall and winter for that chic, rosy glow. 3. Hourglass Ambient Lighting Powder in Dim Light - As mentioned before, it takes me a minute to get on the bandwagon so I have been admiring the Ambient Lighting powders from a distance for quite some time. On an impulse Sephora trip (is there ever any other kind of Sephora trip???? ), I pulled the trigger. The warm peachy undertone of this powder appealed to me first, and when swept on the cheeks and forehead - it gives a warmth to the skin that is less than a bronzer but more than just a pressed powder. The only conclusion I can come to is that it's magic - makeup magic. 4. Becca Matte Skin Shine Proof Foundation (c/o) - A mouthful to say but a dream to wear. After attending a fellow blogger, Danielle's Becca event - I fell in love with this brand, and their entire aesthetic. Wearable shades and color ranges to match any and every skin tone, this is a brand that all can embrace. While it may be hard to believe - finding shades light enough for my skin is often quite the challenge. As soon as I applied this foundation, the color was absolutely perfect and the texture truly kept my skin matte for the day. Summer shine doesn't stand a chance - game on. 5. H20 Sea Moss Replenishing Body Lotion Spray - Morning madness has met its match with this body lotion. Under the name of this product should be listed its biggest selling point - "Just spray and GO!" Truly game changing. Most body lotion sprays I have tried in the past still leave residue on the skin that I have to rub in, and who has that kind of TIME - I have 13,000 coats of mascara to apply. But this is like a fine mist of hydration that immediately dissolves into the skin leaving you feeling refreshed and ready to get dressed. Use it and tell me if you don't shave 5 minutes off your time - hit that snooze button gals! 6. Shiseido Cleansing Oil - Blah, blah, blah - I love cleansing oils more than I love my shoes (well sorta). I feel like a broken record at this point with how much I push cleansing oils - but it's my blog and I'll cry if I want.....er...talk about new cleansing oils if I want to. And every time I find a new a new cleansing oil I love - I have to shout it from the roof tops (or write it on my blog). A great price point and fantastic texture that cuts right through all my makeup, this Shiseido oil has already reserved a place on my repurchase forever list. What an honor. I'm always curious to hear what products all of you are using and loving - leave me a comment below or tweet me @alittlebitetc and let's gush together. 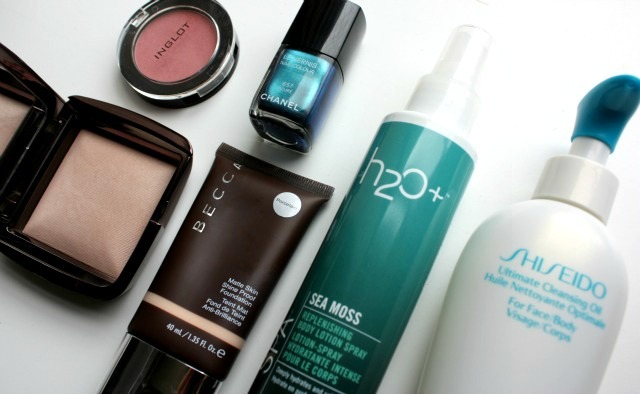 Read all my past beauty favorites here.